video stremaing media including: Netflix, Youtube, Kodi/XBMC and many others. Enjoy your videos or images in crisp HD resolution. Not satisfied with the storage space? You can expand your storage capacity with a SD card up to 512GB or expand further using an external USB hard drive enclosure. Dual HDMI and VGA setup can give you a luxurious dual screen setup giving you the oppertunity to expand your desktop apce and multitask even better than before. 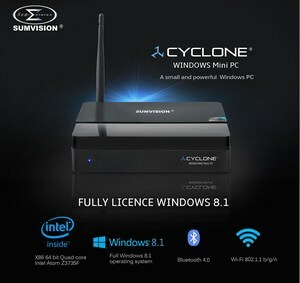 With a power rating of 12W compared to the average PC power rating (220 W) the Cyclone Mini PC can save you money on your electricity bill and function as an eco friendly desktop PC.